Have you ever wondered if you could do more with your business? You know -- introduce new product lines, enter new markets, find more ways to cash in on the brand you've created, maybe even become a Richard Branson-style celebrity in your niche? Well, wonder no more. Just tune in to History Channel's smash-hit reality-TV show Pawn Stars, which averages 4 million viewers an episode. It's so popular the network renewed their contract for 80 more episodes. New episodes air Monday nights at 10pm EST. The show's success -- and the many ways the stars have leveraged their fame -- provides a master class in how to maximize your business's earning potential. 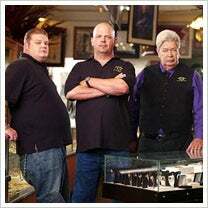 Pawn Stars centers around the owners of the Gold & Silver Pawn Shop near Las Vegas. Four years ago, it was just another nondescript roadside stop where out-of-luck gamblers could raise more coin for the slots by hocking their possessions. Now, it's famed as the place where everything from a submarine to a 16th-century samurai sword might turn up. Part history lesson, part family drama, part mercantile haggling bazaar, this blue-collar version of Antiques Roadshow has a rabid following. Now, the Gold & Silver sits at the epicenter of a mighty sales and marketing machine for owners the Harrison family, who have three generations in the business -- grandfather Richard, son Rick and grandson Corey. This could have led to fifteen minutes of fame and maybe some increased sales at the store, but the Harrisons have gotten so much more mileage from it. The book deal. Let's face it -- many entrepreneurs should write a book. Even if it's an ebook you self-publish only for the Kindle, it helps build your reputation as an authority figure in your niche. Rick Harrison's License to Pawn snagged a major publisher, Hyperion, and came out in June. The website. You just know the Gold & Silver didn't have the snazzy website it has now before the show. Now, if you run an online search for "pawn shop Las Vegas," their eye-catching website gets the first four natural search results. They own their key search term, and every other pawn shop in town is playing catch up. The merchandise. Do you sell T-shirts, water bottles and mugs with your brand on them, or maybe give them away? You should, because these items are a terrific form of long-lived free marketing. The pawn stars are up to their hips in swag, with more than 30 different items all bearing their company name. They've even got bobbleheads with their faces on them. The game. Yes, now you can play Pawn Stars on Facebook. Not only is the game a stellar promotional vehicle, it could be lucrative. If people start paying real money for items they need to win, you know the Harrisons will be in for a cut of that. The episodes. Ever spoken at a conference or taught a course? If you didn't make a video or screencast out of it, shame on you. All the Pawn Stars episodes are now for sale on iTunes at $1.99 a pop. Ka-ching! Turn your knowledge into a product and you can sell it again and again. What else could they do? Paid public speaking that's tied into the book seems like an obvious next step for Rick Harrison. Also, this show should go on tour, just like Antiques Roadshow does, and sell tickets. It could be the basis for a scripted sitcom, too, with comic relief provided by the employee/sidekick Chumlee, who's become a quirky folk hero in his own right. Finally, there's the spin that might come from networking with a whole new, better-quality pool of other business owners and celebrities. If fame ever hits you, connect with everyone you can -- then see what collaborations might arise. Yes, every business owner can't be the star of a hit TV show. But there are more localized forms of fame that can give a business a boost, too. There's podcasting, public-access TV, putting on live events, or just creating YouTube videos that share your knowledge. If fame comes, jump on the opportunity and see how many ways you can grow your business. How are you extending your brand? Leave us a link and show us what you've been adding to your business.